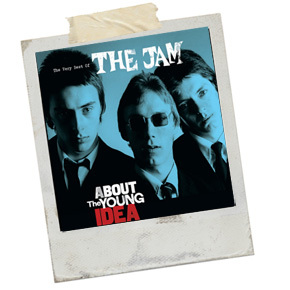 Does the world need another Jam retrospective? Probably not; but because there is an exhibition featuring memorabilia, guitars, artwork and goodness knows what at Somerset House in London (26th June – 31st August) it has been decreed a new Best Of album was necessary to accompany it. What’s not to like? Thirteen Top 20 hits, four number 1’s (when it meant something! ), classic album tracks live fan-favourites and the obligatory 2 x exclusive tracks. We will dispatch the two rarities first – the album opens with a radio advert for the In The City single ad while it’s fun twice; it doesn’t bare a third listen. The unreleased demo Takin’ My Love is far more interesting and obviously the carrot to draw fans to the album. Obviously from their early R&B influenced days it’s a100mph adrenaline and coffee fuelled blast of a song that could easily have been polished up and a place found on the debut album. It sounds exactly like I remember the band playing live on stage. More like this please. Everything else is well chronicled and in chronological order; which is quite interesting in it’s own way. The album begins with the singles that changed popular music (bridging the gap between Punk and what was to become New Wave which was to become Indie). In The City, Modern World and News of the World sound just as angry today as they did in 77 but let’s not forget the likes of Art School which would have been a Top 10 single for anyone else at the time. It’s fun listening to A Bomb in Wardour Street and Smithers-Jones now especially as they sit alongside the radio friendly hits; and do you know what? They’ve all aged exceptionally well; especially English Rose and Butterfly Collector which fans and critics initially hated but grew to love. I wonder how many Jam fans have walked down the aisle to English Rose? I fondly remember poring over the lyrics on the album sleeve and wondering out loud what songs like Funeral Pyre and Carnation were ‘about.’ I still don’t know; but still get a thrill when I heard them today. Who knew what effect Pretty Green would have on a young lad in his Manchester bedroom; but it must have; because in his own small way Gallagher Jr. went on to influence a whole generation and now it’s the name of his successful clothing company. The way the album pans out it, it has been interesting to contrast and compare the raw power of the opening tracks against the ‘big Soul sound’ of Beat Surrender which heralded the closure of an era. This is immediately followed by the ‘note for note’ interpretation of Curtis Mayfield’s Move on Up; which I can remember watching them perform on The Tube with my mouth gaping wide open. Then everything fizzles out with Shopping and the dire Pop Art Poem. What was Weller thinking? It didn’t take long to find out did it? It’s been an absolute joy reliving happy memories listening to this album all day; who else would remember Frankie losing a tooth in a Consett kebab shop as we pogoed to That’s Entertainment? Or a dozen Dads leaping around the dancefloor at son #2’s Wedding reception when the DJ played Start! Or earlier this year when I went to a Mod/Ska Festival headlined by From the Jam and there were as many Mods under 30 as there were old timers. You will have your own memories and that’s what this is all about isn’t it? The Jam has to be in the Top 10 British bands of all time don’t they?